Last month, IMAN’s Arts and Culture Director, Asad Jafri, moved on to do some exciting work with the World Islamic Economic Forum (WIEF) in Malaysia. For five years, Asad helped advance IMAN’s Arts and Culture programming to national and international recognition and furthered IMAN’s long standing commitment to the organic incorporation of the arts into our work. As we get ready for our next Community Café on October 20th, and put the plan in motion for our 15th Anniversary Takin’ It to The Streets celebration, planned for June 15th, 2013, we are eager to see the next phase of our arts and culture programming unfold. While IMAN continues its national and competitive search for our next Arts and Culture Director, Janice Bond is serving as IMAN interim Arts and Culture Manager. Applications can be submitted here. That programming remains grounded in IMAN’s overarching commitment to work in the inner-city, and with marginalized and disconnected communities. Forging spaces that foster artistic excellence and allowing the arts to be a source of hope, inspiration and connectivity, while working for real solutions in the urban space here and across the planet, also remains part of IMAN’s global approach to the arts and community activism. At a time when communities like the one we work in remain profoundly challenged by the scourge of violence, despair and a range of ongoing issues, and the world continues to be confronted with the presentation of “Muslim Rage” as its introduction to the Muslim community IMAN realizes that this work remains profoundly important. The need for the American Muslim community to be ever committed to developing models of hope and inspiration guided by our tradition is one that resonates across the globe. Towards that end, IMAN is committed to the role of arts and creative expression as an integral part of our work, and we ask the Most High to envelop our work with Divine Mercy and Light as we move forward. Stay tuned for more information about Ojalá: Connecting Voices & Visions, the next Community Café on Saturday October 20th in Little Village, our future calendar of events and more on our rollout for Takin It to The Streets June 15th 2013. IMAN Board Member Seemi Choudry and Leader Sadia Nawab were both selected to attend the World Islamic Economic Forum (WIEF) Young Fellows Programme 2012, a six-day intensive leadership program targeted for young “change-makers” all over the world, comprising a diverse range of people from fresh graduates, young entrepreneurs, civil society leaders, community workers, researchers and junior professionals, who have the seed of an idea that they want to help nurture into a real project for their respective communities. The two traveled to Kuala Lumpur, Malaysia and represented IMAN at the program that started on September 9. Nawab’s project at the program won approximately $6.5K in funding, and she will be working with others in her group from around the world to implement that project over the next few months. The WIEF was created to enhance the economic well-being of Muslim communities worldwide through increasing trade and business opportunities amongst them, as well as the world at large, and to strengthen networking and foster strategic alliances through the exchange of ideas, information and knowledge. The Young Fellows Programme is intended to nurture a leadership concept in young people that focuses on overall human growth, including management, entrepreneurship, environmental and social awareness, and the spiritual well-being of an individual. It is tailored to not only implant a leadership mentality amongst its participants, but to also inculcate the culture of working as a team, and the sharing of ideas with the wider network to achieve common goals and aspirations. Sadia Nawab: The WIEF conference was beyond invigorating. I learned about project management, marketing, Islamic finance, environmental sustainability and other topics from social entrepreneurs, CEOs of top-performing Malaysian companies and banks, and from others in the field of social enterprise. The skills were practical and implemented immediately as our groups were assigned to create a business and pitch our model amongst a panel of judges; in fact, my group won approximately $6.5K to initiate a social enterprise that provides profit-sharing financing to small businesses. Our group of 23 fellows from over 13 countries worldwide really bonded over the week. One of the most meaningful skills I will take away from this program is the development of leadership from within oneself, which we learned in workshops and also from the example of our amazing organizers and facilitators. Seemi and I were so inspired from this conference that we will be conducting a series of workshops ourselves to share the skills we learned with others. Stay tuned for them as they will be held in early November! Seemi Choudry: The WIEF Young Fellows Program certainly surpassed all of my expectations. Not only were we able to connect with young leaders from fifteen countries around the world, we also had the unique opportunity of strengthening our personal and professional skills to become successful social entrepreneurs in the fast-paced world that we live in. I feel extraordinarily blessed to have been a part of this group of pioneers. Our closing slideshow used John Mayer’s song “Waiting on the World to Change” as the soundtrack. However, I respectfully contend, we aren’t waiting; we are already changing the world! The Annual Islamic Society of North America (ISNA) Convention–the largest gathering of Muslims in North America–punctuates the calendar of many Muslim individuals, families and organizations; IMAN is no exception. As IMAN’s model of civic engagement has garnered national attention and as ISNA has funded some of our on-the-ground projects in Chicago, such as the first Green Reentry house, the two organizations have been supporting each other in many different ways. For IMAN, this has meant having a visible presence at the Annual ISNA Convention in the last few years. This year was no different. Six members of IMAN’s staff traveled to Washington D.C. to attend the recent convention over the Labor Day weekend, titled “One Nation Under God, Striving for the Common Good.” The visible presence of tens of thousands Muslims in the nation’s capital, two months before a big election, seemed to say that Muslims are ready to assert their place in American society, because Muslims are ready to strive for the common good. At IMAN, we believe that our mission and work can be one of the models for the American Muslim community in this striving. In particular, the IMAN delegation was there to represent our work, support ISNA, and connect with the convention attendees and speakers (though meeting old friends, and shopping, is inevitable at any ISNA convention!) It was also the first major opportunity to start getting the word out for Streets 2013, now less than a year away. Medical Director, Dr. Altaf Kaiseruddin, represented IMAN on the panel at one of the healthcare-related sessions, and presented on the model and work of the Health Clinic. As we covered many of the sessions over the weekend, it was gratifying to see how many of IMAN alumni and supporters, scholars and activists alike, were featured prominently on panels covering leading-edge social and civic issues in the Muslim and/or broader communities. ISNA is perhaps the most important organization representing Muslims in North America; it has reach, weight and connections. Our participation in the 49th Annual ISNA Convention continued the process of investing in our relationship with ISNA and its community, in an effort to ensure that both our organizations can be the best they can be. Zeinab Bakhiet recently joined IMAN as an Executive Fellow. The Executive Fellowship is a one-year program that exposes the Fellow to a broad range of IMAN’s work and aims at building a functional understanding of community organizing and advocacy, donor cultivation, fundraising, and non-profit administration and management. Last Ramadan, IMAN launched the Refresh the ‘Hood Challenge, a month-long initiative seeking to confront issues of food access through community engagement, which stems from Muslim Run: A Campaign for Health, Wellness, and Healing. Every Tuesday and Thursday afternoon during Ramadan, IMAN leaders and staff set up shop in front of two partner stores distributing free fruit smoothies to promote subsidized produce sold inside the stores. During these visits, IMAN leaders engaged community residents in dialogue, and encouraged them to think deeply about the disparities in food access and to envision how healthier options could impact their communities. In addition to challenging the community members to see if affordable alternative food options can influence healthy choices, we also wanted to challenge local storeowners to use Ramadan as an opportunity to tackle stereotypes around the corner stores by first working to nourish the community. 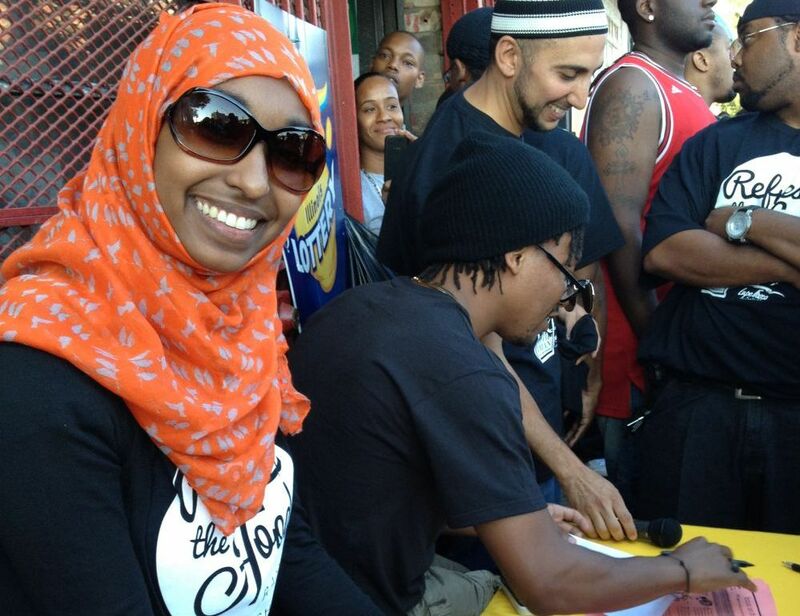 IMAN partnered with the Lupe Fiasco Foundation on this challenge and hosted an incredible kickoff event in front of Payless Grocery on July 31, which featured a surprise visit from Lupe Fiasco himself. Our team of staff and leaders gave out over two hundred fresh fruit smoothies, conducted surveys, handed out information packets about nutrition, and met with community residents. Visitors also enjoyed a nutritious vegan meal, courtesy of Brother Zarakyah from Soul Vegan. By the time Lupe arrived, the crowd was well fed, and excited to take pictures with and receive autographs from the hip-hop star and activist. The most poignant moment of the day came just as Lupe was about to leave, when a youth from the block muscled his way through the mass of people surrounding Lupe and asked for thirty seconds to spit his rhymes. Lupe gave him the go ahead and listened intently at lyrics that were peppered with references to violence, gangs, and drugs, all a reflection of the negative influences in his environment. At the end, Lupe genuinely complimented the youth on his artistic skills, but then challenged him to take a more creative approach by using his talent as a beacon of light and hope, rather than to serve as a mere reflection of the negative influences in his environment. The interaction can be applied more broadly to what we at IMAN are attempting to do through our Muslim Run campaign: to see the potential in existing resources and then agitate for positive change. In many ways, Refresh the ‘Hood was, for me, the ideal introduction to IMAN’s programs, partners, and beneficiaries. In addition to seeing Lupe Fiasco in action, I was able to witness a group of staff and leaders take to the streets and engage with community residents in ways that are important and meaningful. For instance, there were leaders like Sister Anam, who conducted countless surveys, but then stowed her pen and clipboard away, and listened with understanding and compassion as a brother explained how poverty had forced him to fast that day, even though he was not Muslim. I also witnessed the radical generosity and unwavering commitment of our partner organizations–the Lupe Fiasco Foundation, Al Bawadi, and Soul Vegan–who gave immensely of their time and resources. When I began my fellowship, I knew that many complex dynamics were at play on the South Side of Chicago and that issues of race, faith, politics, and differential access to resources are all a prominent part of the work we do at IMAN. But I also knew that the staff and leaders I would meet at IMAN are both highly ready and profoundly inspired to tackle these issues. I am blessed to have been a part of Refresh the ‘Hood this Ramadan and I look forward to seeing how this effort impacts the larger Muslim Run campaign.